We Lead and Others Follow !! GWG providing nonpareil HSE training services at India, UAE, Africa, Iran, Angola and Oman and has scaled new heights of excellence in safety training in a very short span. GWG’s Safety Training program enlightened the career path of thousands of candidates by transforming them to successful HSE professionals. GWG is on the verge of reaching it’s another milestone this NOV ’13. ‘The 200th Batch’: The first regional institute achieving this Success. Celebrating this Occasion, Green World Group has introduced Exclusive Bonanza Offers for their Chennai Batch commencing this 28th Nov.
A LIMITED TIME OFFER… NEVER MISS IT..
Dream come true OFFER .. Exciting very Discounted package Only for this NOVEMBER BATCH @ Chennai. GWG Training programs truly deserves pride among candidates for their career advancement and having profound knowledge enabling them enhance their safety skills through GWG’s Certification Programs. 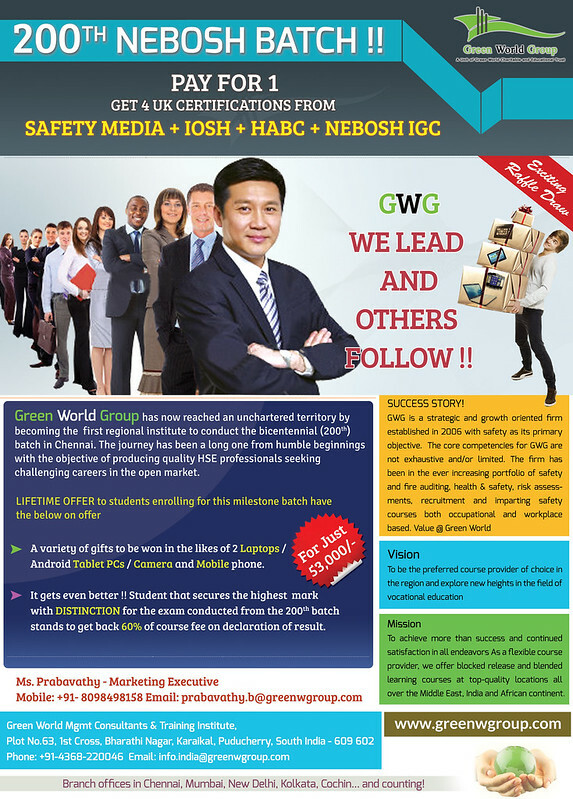 Green World Group’s safety program helps sharpen one’s professional edge and is poised towards their growth. Through our Safety education program one can experience a new spurt in their existing skill sets and especially when it comes to honing up their innate skills to flourish. Green World group provides you an ulcerative array of benefits with our training programs makes you expertise and enhance your professional skill set in safety practices enabling handle your safety responsibilities perfectly at work places. your certification is valid from any recognized Tech Board or university. PLease intimate the date of commencement of the nebosh course inchennai during this month .